There is something about January that makes people want to diet and exercise. Just the word diet implies so much “yuck” that I have come to detest that word. To me, it stands for, “You can’t eat this, or that, or that, or that…” and well, you get the picture. But one thing you shouldn’t have to give up, sausage! 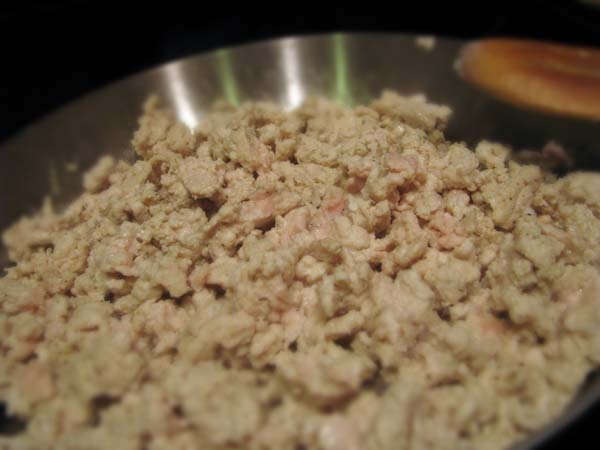 Just like I use ground turkey for ground beef, I substitute chicken sausage for regular sausage. I’ve made a few dishes with chicken sausage, but my favorite includes a small bed of pasta, topped with marinara, sautéed spinach, and then sliced sausage. 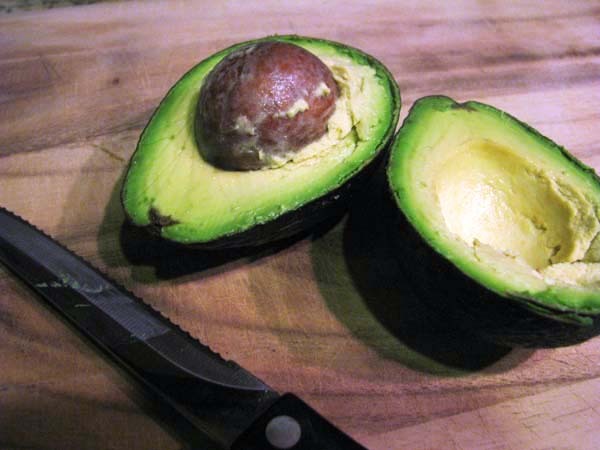 The final product is impressive, but the process and ingredients are so easy. 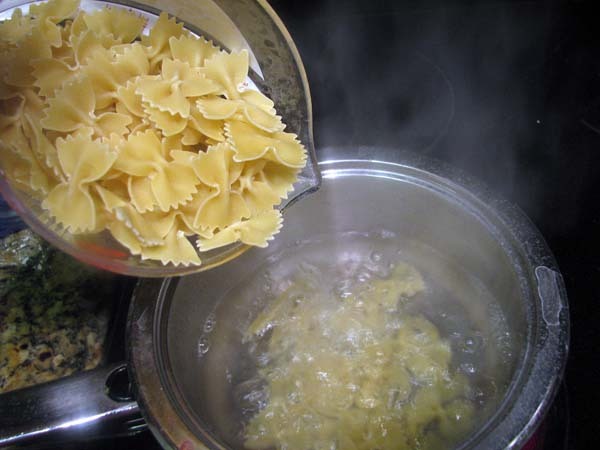 First, in a medium size pot, heat four cups of water to a boil for your pasta. Add 1/2 tsp salt if desired (I always add salt to my pasta water, even just a pinch makes a difference!). First, add 1 tbsp olive oil to a frying pan set to medium high. Next add 1/2 a medium onion, quartered. Then add your sausage. By this time, your water should be ready for the pasta. This is a great time to prep your sauce. I love making big batches of sauce and saving them in small containers for easy use. However, you can always use my marinara cheat or a jarred sauce if you’re short on time. 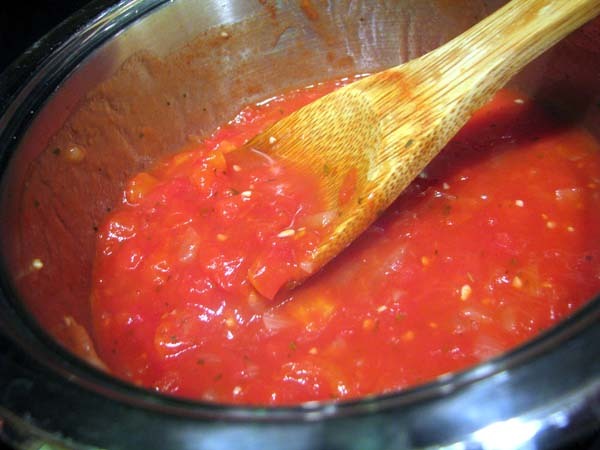 If you are making a fresh sauce, reserve about 1/2 cup of tomato juice for later. Be sure to check on your sausage, as you want the skin to brown evenly. If you notice that your sausage is browning to quickly, turn down the heat to low and cover to finish the cooking that way. 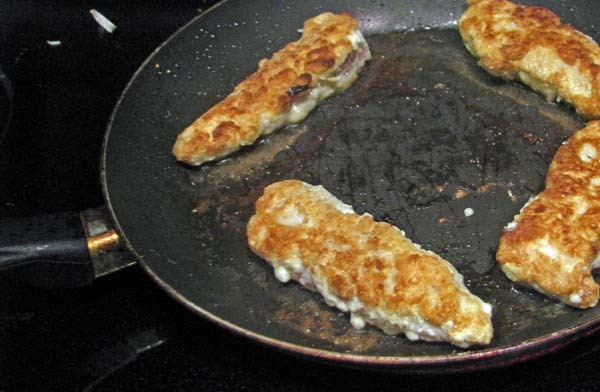 If the sausage is sticking to the pan too much, you might have not used enough oil, or the sausage isn’t ready to turn over yet. Of course, little bits will stick to the pan here and there, creating what could be a terrible to clean up mess. However, we’re going to fix that. Remember that tomato juice from earlier? Now its time to add it to your pan to deglaze the caramelized bits on the bottom pan. And just like that, all those bits of flavor are suddenly incorporated into your sausage and onion flavors. If you didn’t use a can of tomatoes and don’t have the reserved juice, take about 1/4 cup marinara and add 2 tbsp water and then add that to the sauce. It’s the acidity from the tomatoes that help this to happen. The smell at this point is almost heavenly, but resist the urge to eat them now! Check your pasta and drain if ready. Its time to get our last step ready, the spinach. 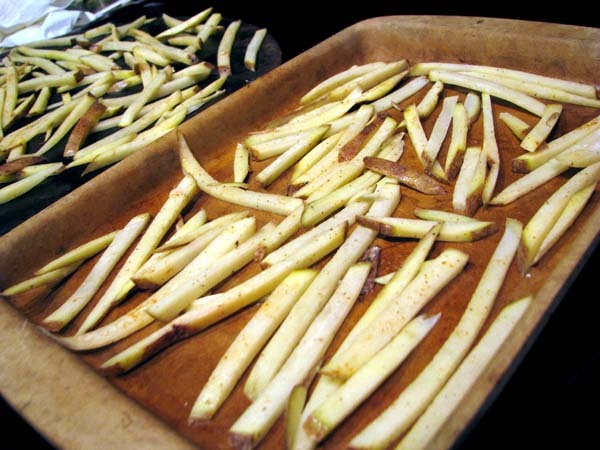 Add 1 tbsp butter, 1 tbsp olive oil and 1/2 minced garlic to a non-stick pan over medium high heat. Then add a heaping mound of baby spinach. I use about 1 big handfuls for each serving of this dish. 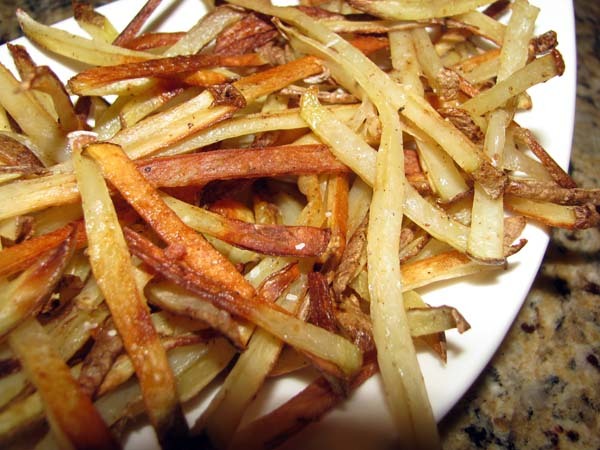 If you need more than two servings, be sure to adjust the amount of oil, garlic, and butter too. Carefully toss the spinach until just wilted, and then remove from heat. At first, the pan might seem too dry, but it will come together quickly. The big mound of spinach turns into a very small amount, in an even smaller amount of time. If you or someone eating this dish doesn’t like spinach, substitute with another more favorable vegetable. Asparagus or broccoli might work, but will impact the overall texture, since spinach is soft and incorporates better with the pasta. Now its time to serve. First, layer the pasta followed by a serving of marinara, and sprinkle with a dash of basil. Next, add your sautéed spinach. To incorporate the onions and sauce in the sausage pan, drizzle it on the spinach. Then, slice your sausage at an angle, and arrange atop the spinach. 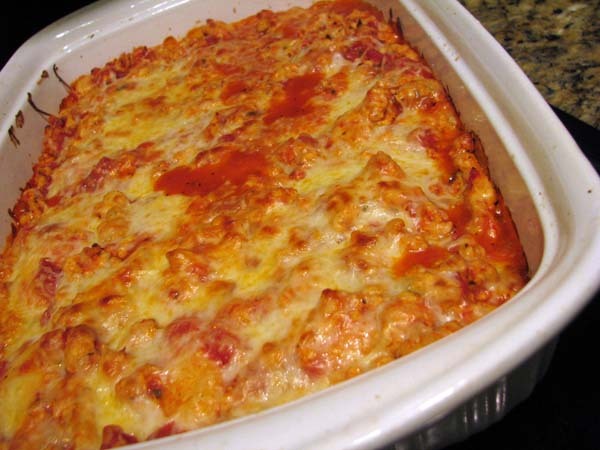 This is a flavorful and filling dish without all the extra fat of a pork sausage, pasta heavy, cheesy Italian meal. Fresh spinach, light pasta, healthy sausage…time to say goodbye to the January diet! Serve this dish with a side of fruit for an even better meal. Ever have one of those shopping trips where you pick something up because it looks good and/or is such a great deal you can’t pass it up? Well that’s where this box of Mrs. T’s Pierogies came from – upon which my husband gave me a look that pretty much said he would never eat them. HA! Oh yes you will, you just won’t know it! Now handmade pierogies sound pretty good and are a holiday tradition in some families. Each family has their own special filling of ingredients. But something frozen in a box, not so much. I had no idea what the texture would be like, or flavor for that matter. Also, in a suggestion recipe on the back, you added them to a recipe completely frozen. Eekk! There were 12 in the package and I immediately thought of a casserole. 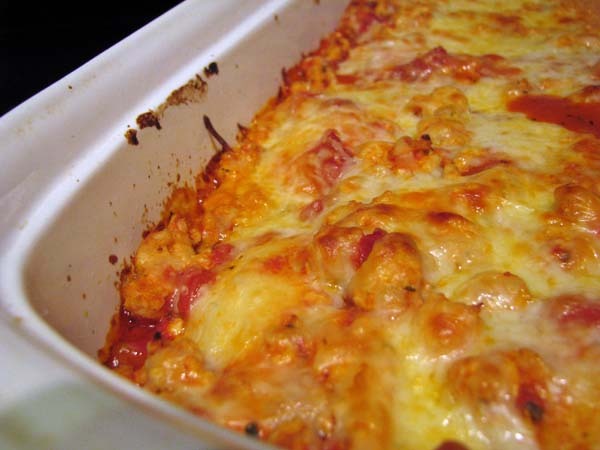 Even though casseroles aren’t my favorite, they are simple and easy. 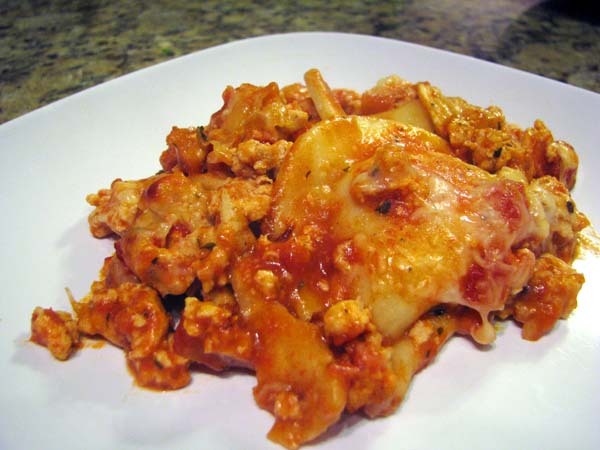 Because pierogies are really just potato dumplings, I thought of layering them with a marinara, ground turkey and cheese. 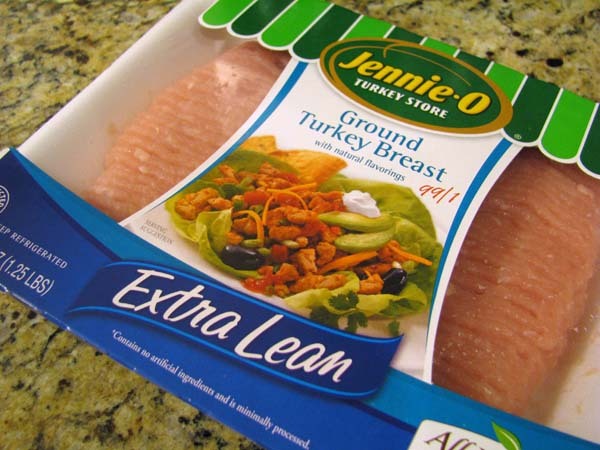 First, I grabbed my favorite go-to dinner ingredient, extra lean ground turkey. 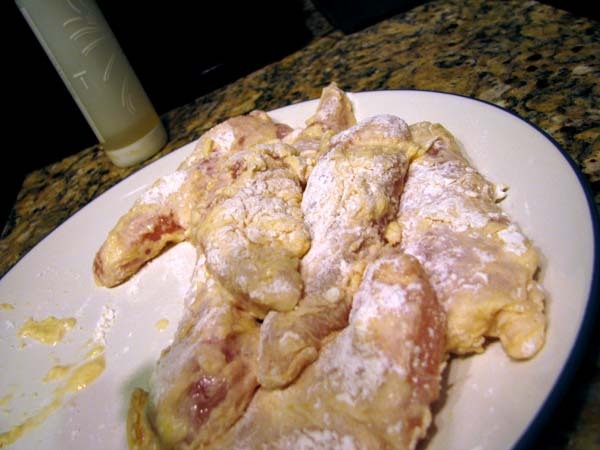 Season with salt and pepper and the tiniest bit of oil (unless you use a non-stick pan). 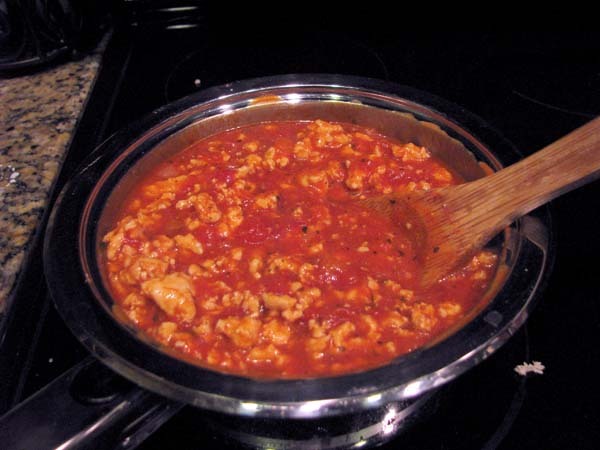 Once turkey is almost fully cooked, add to your marinara sauce to complete the cooking. I used my recipe for quick marinara in this recipe. After adding the meat, you’re reading to assemble your dish. 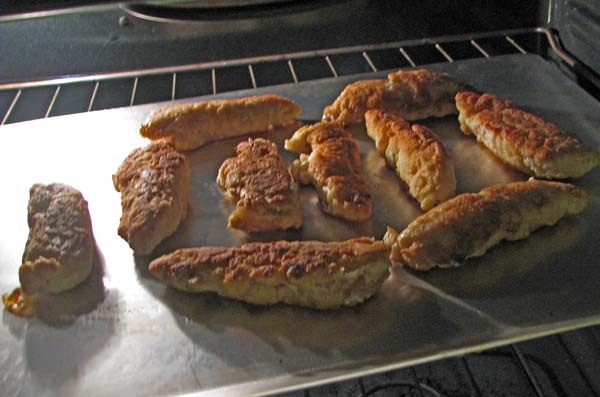 First, place your pierogies on a lightly oiled (to prevent sticking) 9×13 pan. Then carefully pour your meat marinara over the dish. 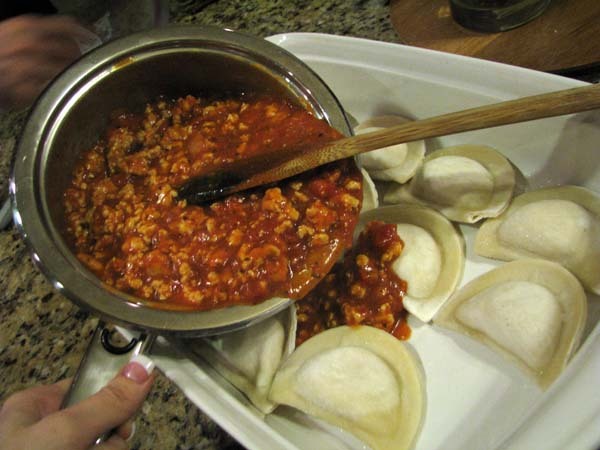 Try your best to keep the pierogies in place and saucing the entire dish evenly. Next, add 1 1/2 cups of mozzarella cheese. 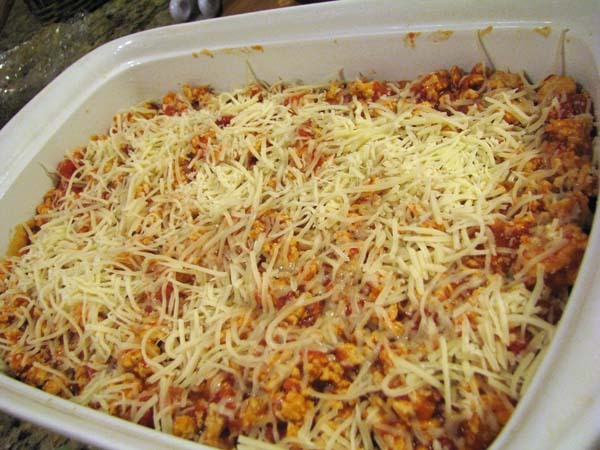 Place your dish in the oven for 30-40 minutes, or until the cheese is fully melted and bubbling. And while this dish doesn’t plate so well, it tastes delicious. It’s a hearty meal, definitely made for a man who loves meat and potatoes! 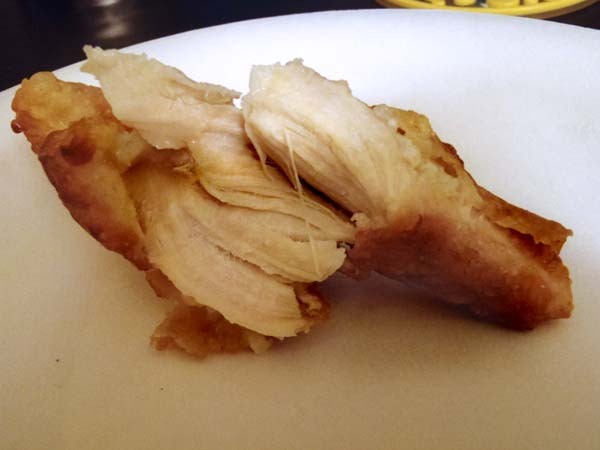 My husband devoured this dish without questioning what he was eating. It tasted similar to a filled pasta dish, except with a potato filling instead of a cheese filling. And like most dishes with marinara, the flavor was even better the next day! And now he also knows that he likes a new food – handmade pierogies might make an appearance in our house soon! A good marinara can be the difference between an okay pasta dish and an amazingly delicious meal. And there have been times that I have let a sauce simmer on a stove for three hours before using it in a dish that is baked for an additional hour. But some days, I don’t have four hours to devote to a meal. In fact, I nearly have around 30-40 minutes each night from the time I get through the door to get dinner on the table to eat and enjoy before we’re off to something that night. So I like to cheat on marinara. Okay, so seriously, I love to make this homemade sauce that tastes like it took much more effort and time. 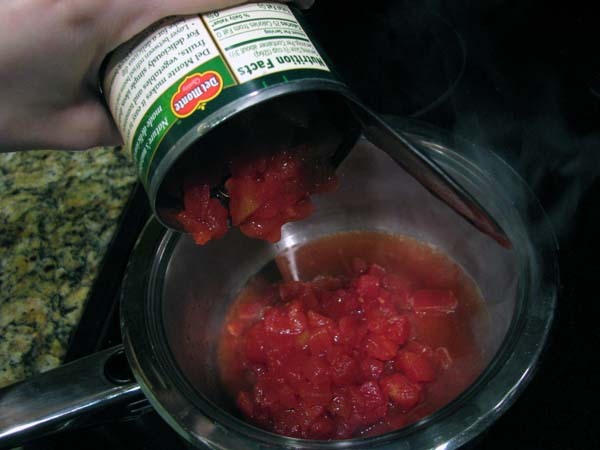 To begin, grab a can of petite diced tomatoes, and drain some of the excess juice. Probably somewhere around 1/4 cup. Add the tomatoes and the rest of the juice to a medium pot. Next add 1/4 cup of diced onions. 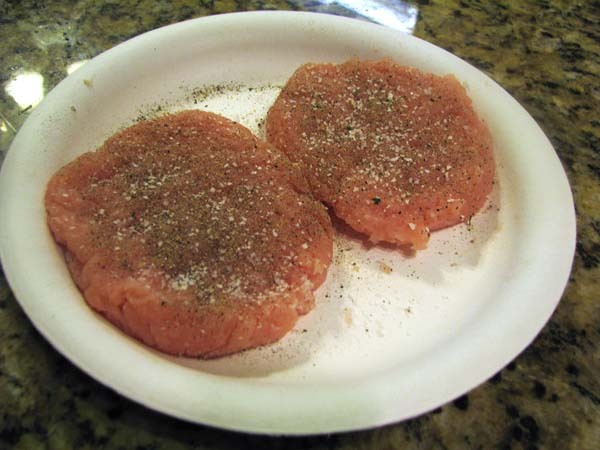 Then add 2 cloves of minced garlic, 1/2 tsp of salt, 1/2 tsp basil, and 1/2 tsp onion powder. Then the cheat…add 1/2 cup of your favorite jarred tomato sauce. 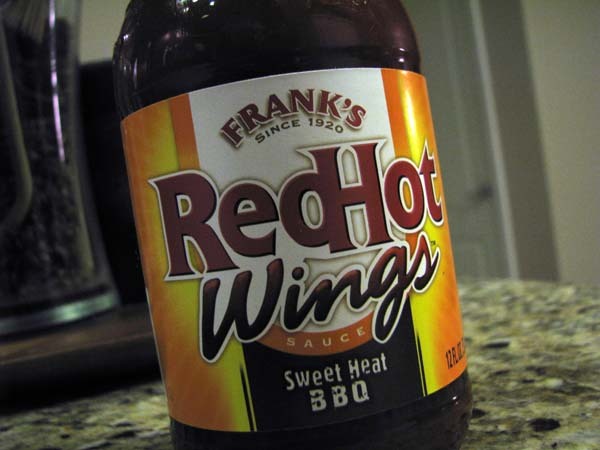 Let the sauce simmer while you create the rest of your meal – whether it be noodles, meat, etc. 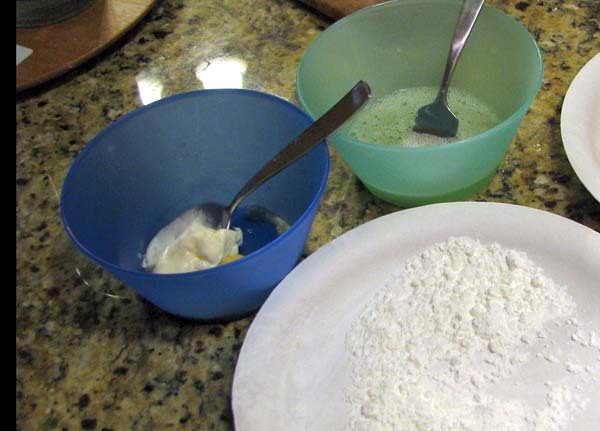 Five minutes before serving, stir in a slurry of 1 part water to 1 part cornstarch. Don’t add to much otherwise you’ll end up with a pink sauce! Better to add a little of the slurry at a time until you arrive at the thickness you like. 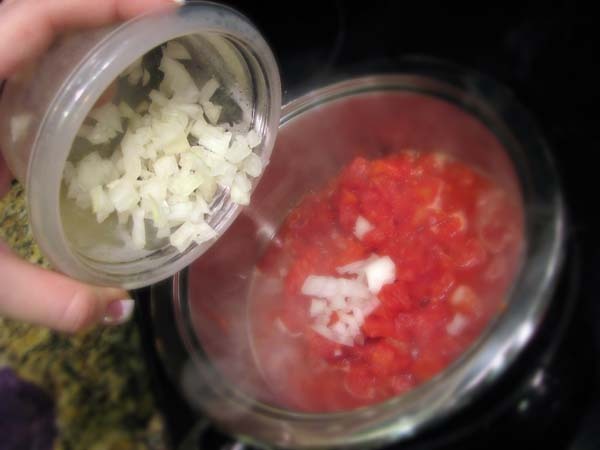 If you plan to finely blend your sauce, turn off the burner and pour the sauce into the blender. Return to the pan to keep the sauce warm until ready to eat. 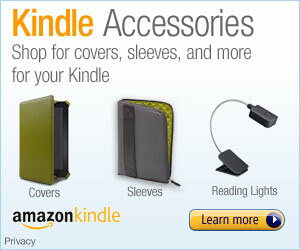 Either put it on a low setting, or turn burner off and cover. In our house, we love tomatoes, so we don’t blend the sauce together. For me, tasting the individual pieces of tomato makes it more homemade. 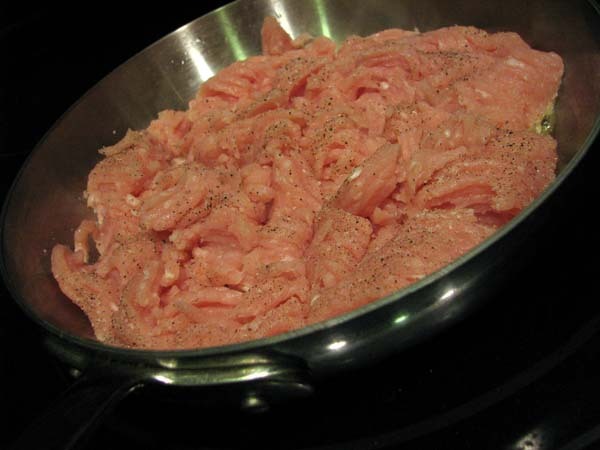 If you want to make a meat sauce, now is the perfect time to add your pre-cooked ground beef, or in this case ground turkey. Even without meat, this sauce is the perfect canvas for your favorite flavors. Experiment with different varieties by adding red pepper, or mozzarella cheese, or even using a can of tomatoes that already has seasoning in it. Any way you do it, it sure beats the long wait of the usual homemade sauce!